In 1850, this land was the site of a three-story gristmill, which processed wheat, buckwheat and cornmeal for the people who lived in the village of New Germany. 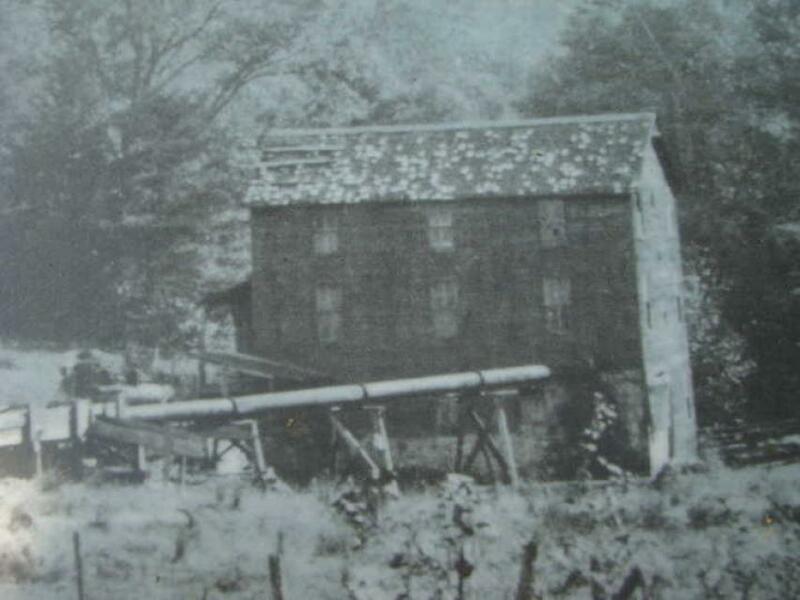 John Swauger built the gristmill piece by piece, using hardwood from his own property, carving and polishing many of the gears and pulleys by hand. In the early 1900's the mill was sold to Irish immigrants Phillip and Michael McAndrews, who built an imposing ten room home next to the mill. The mill remained at this location until the early 1930's when President Roosevelt's Civilian Conservation Corps bulldozed the entire operation to make way for the parking facility you see before you. This work was the beginning of what would become the recreation area known as New Germany State Park. Today, all these buildings have vanished. Only the old millstones standing guard at the entrance to Parking Lot #5 remain. The gristmill was a huge structure with three stories and a basement. It was operated with waterpower from the nearby lake. A sluice, or millrace, was built on a series of trestles to move the water from the east side of the lake to the mill. The water passed under the dirt road by way of a wooden culvert and then entered the sluice. The sluice then carried the water several hundred yards into the mill. The water was funneled onto an overshot wheel, about 40 feet in diameter. A series of large buckets occupied the outer perimeter of the wheel. The weight of the water filling the buckets caused the wheel to turn. The basement housed the main drive gear, from which a series of other gears were operated by various belts, driving the mill's many grinding operations. Excess water from the mill's operation ran off into nearby Poplar Lick Run. This marker can also be identified by its HM code. You can use the hashtag #HM15KM in tweets, and any other place where you might refer to this marker, including when searching on this site.